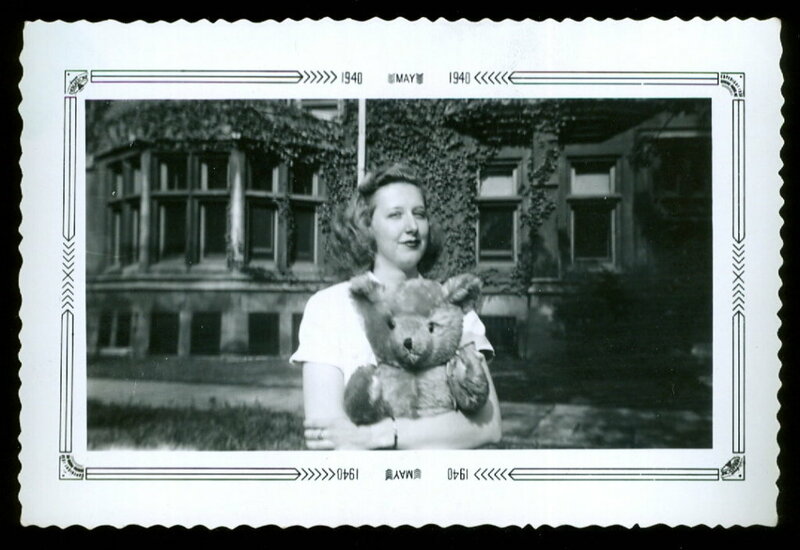 What a sweet vintage photograph of a woman and her bear friend! The photo is dated May 1940. 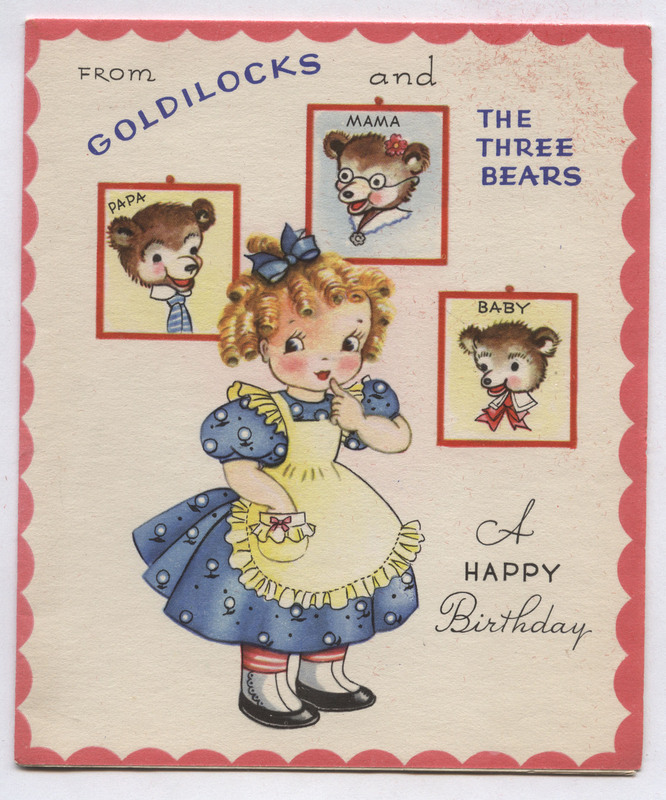 This vintage greeting card has birthday wishes from Goldilocks and Mama Bear, Papa Bear, and Baby Bear, aka The Three Bears. Along with the cute illustrations (there are even three bowls of porridge on the back! 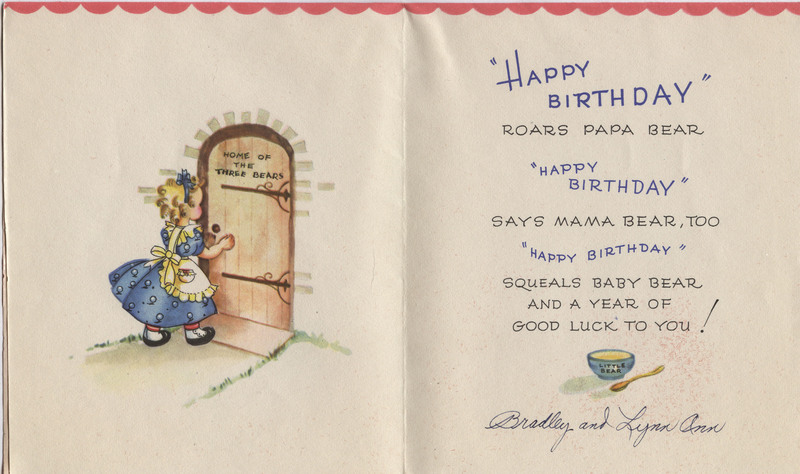 ), this card opens to reveal a four-page storybook! 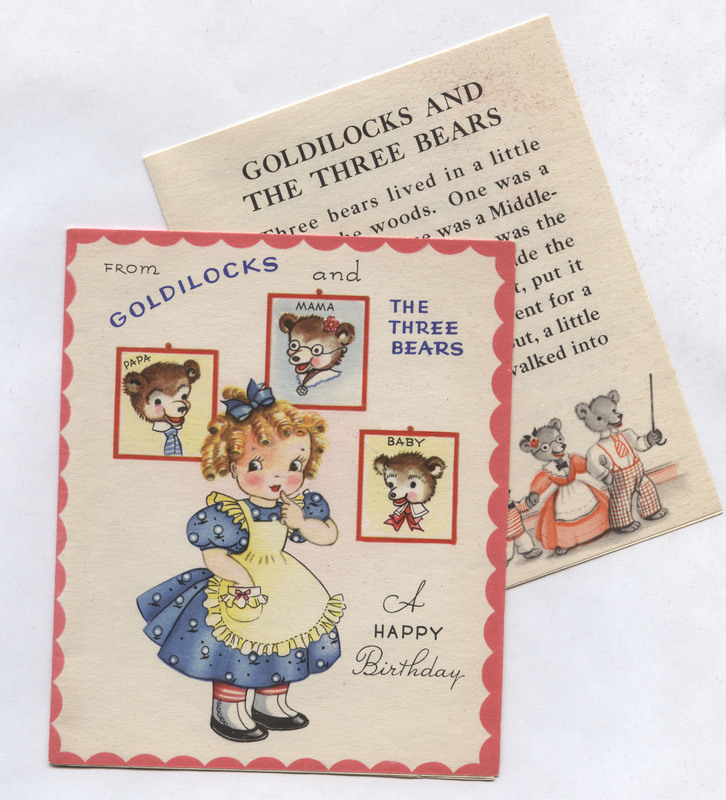 The story is, naturally, of Goldilocks And The Three Bears. The back of the card only bears the stock number (565) and Made in U.S.A., but the back of the little story-booklet (also marked 565 and made in the U.S.A., so it’s surely its original mate) says the copyright belongs to A.G.C.C., 1949. A.G.C.C. made several versions of these greeting cards for children with nursery rhyme story inserts — a great way to begin collecting vintage greeting cards! 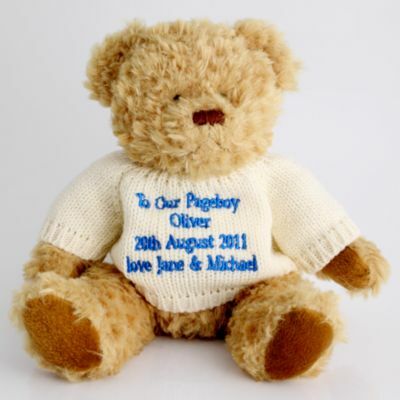 Now in our Etsy shop. Seventy years ago — long before Itchy & Scratchy appeared on the Krusty the Clown Show on The Simpsons — there was Tom & Jerry. The series of animated theatrical shorts was created for Metro-Goldwyn-Mayer by Hanna and Barbera. William Hanna and Joseph Barbera ultimately wrote and directed one hundred and fourteen Tom and Jerry cartoons (and earned seven Academy Awards for Best Short Subject, Cartoons) for the MGM cartoon studio in Hollywood between 1940 and 1959, when the animation unit was closed. Tom & Jerry would live on, however, with different animators and studios before returning home to Hanna & Barbera. 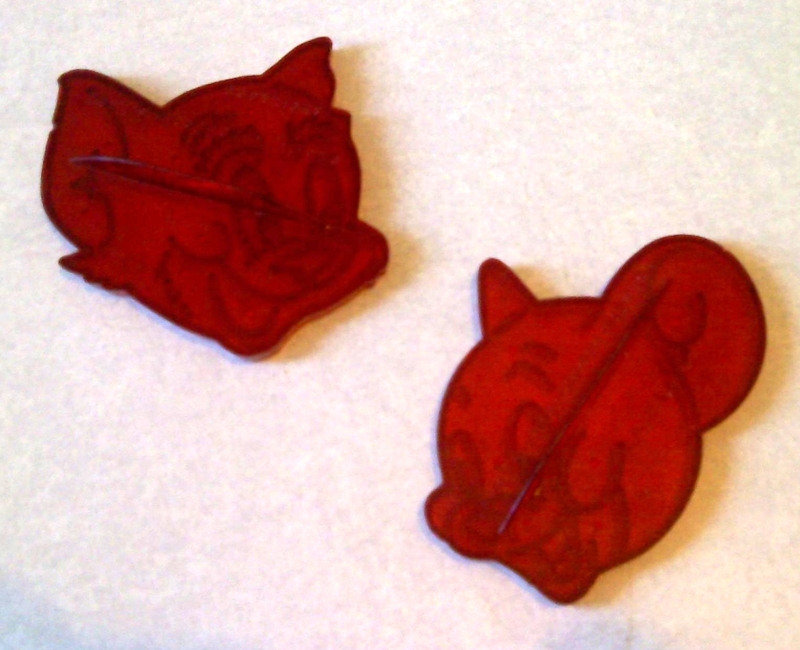 The incredible popularity of the never-ending cat and mouse games between Tom the cat and Jerry the mouse produced these red plastic cookie cutters by Lowe . Along with the heads of Tom and Jerry, I also have Barney Bear, Droopy Dog, and a full body cookie cutter of Jerry. 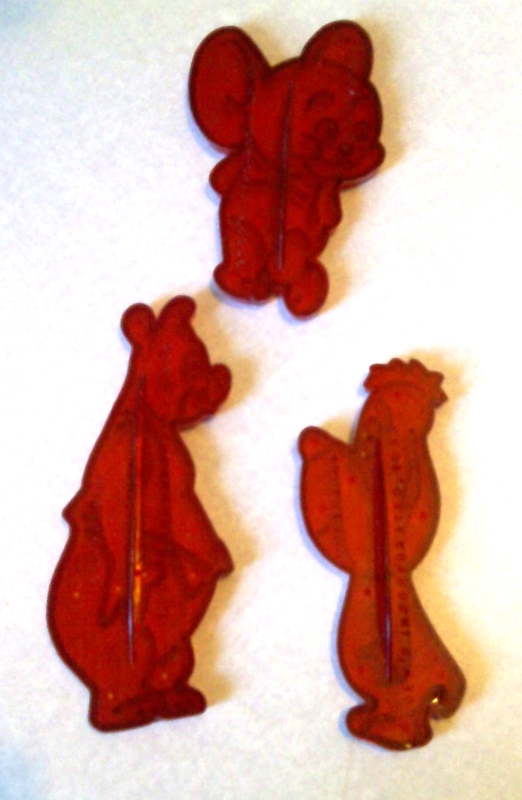 These particular cookie cutters, , marked with a copyright date of 1956, are made of a sheer red hard plastic — but the series was also available in green.